Sid teaches his beautiful arrangements of Bill Evans tunes. Discover the connection between jazz pianist Bill Evans and the playing of guitar greats like Lenny Breau, Jimmy Wyble, John Stowell and Sid Jacobs! 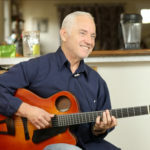 In this enhanced version of the 2006 masterclass from Sid Jacobs, you will get to see how understanding guide tones, voice leading, counterpoint, melody and using open strings can create a unique sound for your jazz guitar playing. Sid Jacobs shares his insights studying and dissecting important aspects of pianistic playing as applied to guitar. We’ve also included newly segmented videos which will allow you to revisit your favorite parts of this video quicker. The new Soundsliced versions of Sid’s arrangements will also help you work on his arrangements easier as you can slow down the audio, loop sections and even see fretboard visualizations of the notation and tablature. Song examples includes classics from Bill Evans like My Bells, Waltz for Debbie and Very Early. In addition to seeing how Sid has translated Bill’s approach to guitar, you will also get to see the approach applied to other jazz guitar essentials like All The Things You Are, Stella By Starlight and the beautiful ballad Chelsea Bridge. Sid also shares tips on how to maximise your practice time for his book, The Bill Evans Guitar Book which is becoming a modern classic for jazz guitarists interested in modernising their chord vocabulary. Prepare your guitar for new sounds you’ll be delighted to play and get this masterclass today! Includes 15 Pages of PDF materials in standard notation and TAB. Full video is 1 hour 38 min. To be able to spend an hour and a half in the presence of one master teaching the music of another master is a rare treat. To watch and listen to Jacobs think through all of this material is pure gold. Do not hesitate checking out this course. It’s the sort of lesson that rewards repeated watching and most importantly, playing through. Your playing will thank you; your bass-player and piano-players will thank you… I just can’t say enough great things about this course.